Ningalkkum Akam Kodeeswaran(NAK) 1 Crore winner Sanooja is on cloud nine after receiving the check of one crore from superstar Suresh Gopi. 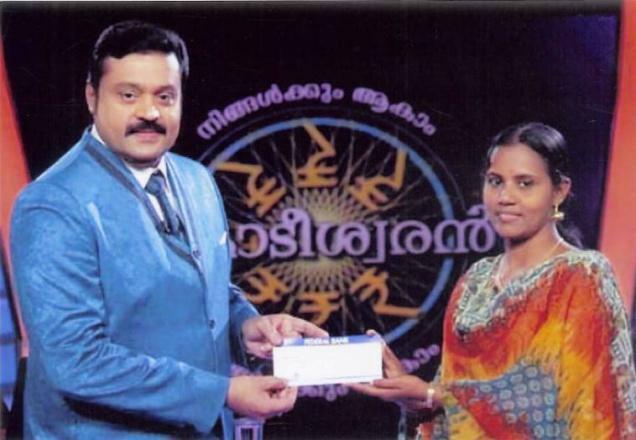 Asianet Ningalkkum Akam Kodeeswaran(NAK) 1 Crore winner episode will be telecast on 30th April 2013. Sanuja, a native of Thiruvanathapuram work sand last grade assistant at Collectorate. Television viewers around the world who had been enjoying each episode of NAK were asking only one question – who won 1 Crore in Ningalkkum Akam Kodeeswaran? Any way the answer to the question is Sanooja, a native of Nedumangad, Thiruvananthapuram. It was a dream come true for Sanooja who answered all the questions correctly, becoming the first contest to achieve the task in the history of the show. Bring a last grade assistant at Collectorate, she has been going through the most challenging phase of life. Sanooja's husband works on daily wages while her two sons attend the school. Even while passing through a miserable life, the courage she kept gave her the reward, 1 Crore which is much enough for her to build her dream house and give better education for her children. "Ningalkkumaakam Kodeeswaran", which entered the second season had been an unique platform for many people to own a life which they kept as dreams for years. The show telecast presented by superstar Suresh Gopi from Monday - Thursday at 8 PM to 9.30 PM had been a highlight program of Asianet with millions of viewers enjoying it. Belonging to a normal family, Sanooja has proved her mettle in the game of general knowledge. The stunning and breath taking episode will be telecast on 30th April 2013 in Asianet. Ningalkkum Aakaam Kodeeshwaran (NAK) based on the UK's hit game show Who Wants to Be a Millionaire?, had changed the destiny on many people in the past. The highest amount won in the first episode was Shyla C.K a contestant from Idukki who won 50 Lakhs answering 14 questions correctly. If the tagline of season 1 was Oru Chodyam Madi Jeevidam Maraan (English: One Question Is Enough To Change The Life), the second season started with a bang with the tag line Orarivum Cheruthalla, Deyvathinte Varamaanu (English: No Knowledge is Small, It Is The Blessings Of God). Sangeetha from Painavu won Rs 25 Lakhs on the 3rd day of the 2nd season. After witnessing 'All Asianet Serial Celebrities Week', now Kerala is waiting for the 'First Crorepati'. So don't miss the coming episodes of Ningalkkum Aakaam Kodeeshwaran which features 1 Crore winner Sanooja.